Fairy Tale Fandom: Fantasy Literature Rewind: Five Children and It. Fantasy Literature Rewind: Five Children and It. It’s an old saying, one that might be bordering on cliché. Yet, it’s a message that is used constantly, especially in fantasy fiction. It was the message of “The Three Wishes” from More English Fairy Tales. It’s also the message of “The Monkey’s Paw” by W.W. Jacobs, the cartoon The Fairly Oddparents, the movie 16 Wishes and even Disney’s version of Into the Woods. I’ll admit, I’m probably missing a few examples but we don’t really have all day to list them here. What I’m really getting at is a couple things. For one, this simple concept still has legs even though it has been used a million times. Also, it’s the central concept behind another classic work of children’s fantasy: Five Children and It by Edith Nesbit. This is another of those children’s books that may have escaped your notice if you haven’t either taken a class on children’s literature or grown up in Great Britain. 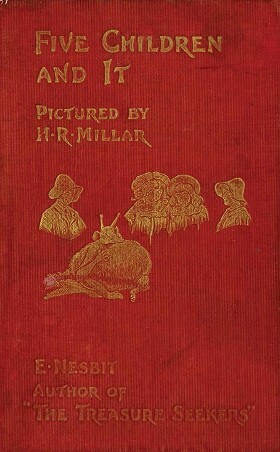 Regardless, Edith Nesbit (or E. Nesbit) is considered by many to be the creator of the modern children’s book. Nesbit drew on her own experiences as a child and as the mother of five children to write a number of children’s books that were popular during the transition period as the Nineteenth Century gave way to the Twentieth Century. She also wrote a number of books for adults. Trying to describe Ms. Nesbit’s rather extraordinary life would take up the better part of a post by itself. However, I should note that they include a cheating husband, membership in a Socialist think tank and possibly a fling with George Bernard Shaw. You can find a biography for her HERE and HERE. The story of Five Children and It concerns five children: Cyril, Anthea, Robert, Jane and their baby brother who is simply known as “The Lamb”. These five have recently moved to a country home after spending two years cooped up in London. Despite just arriving their parents are called away, leaving the five children in the care of servants. Though, with the servants busy with their own duties, they were mostly left to their own devices (a situation that reflects Nesbit’s own childhood on many occasions). It’s on one of these days left by their lonesome that they decide to go digging in the gravel pit. It’s in the gravel pit that they discover the genesis of the whole adventure: The Psammead. The Psammead (pronounced “Sammyad”) is a sand fairy that has the ability to grant wishes and is obliged to grant them to the person who catches him. The Psammead can generally only grant one wish a day and they only last until the sun goes down. The basic premise flows from this. Every day, the children make a wish. Usually it’s something that seems like fun. Other times it’s something that they wish off hand that they didn’t intend to become real. While the majority of them are fun at first, they soon go awry and the children are soon waiting for sundown for all of it to be over. Among the things they wish for are to be as “beautiful as the day”, a fortune in gold coins, wings to fly with, to live in a castle under siege and for their baby brother to grow up already among other things. They keep trying, with the hope that the next wish will be a better wish without any downsides. Eventually, they have their final wish which escalates their problems to the point where others are at risk of getting caught up in it and have to fervently wish it all away. It sounds simple, seeing as it has the basic “be careful what you wish for” plot and the lack of any sort of true antagonist. However, the truly noteworthy thing is in how Nesbit pulls it off. She really seems to break a number of unwritten rules. In its own way, Five Children and It is a work of urban fantasy. Everything, even the magic, happens in what was then the modern world. 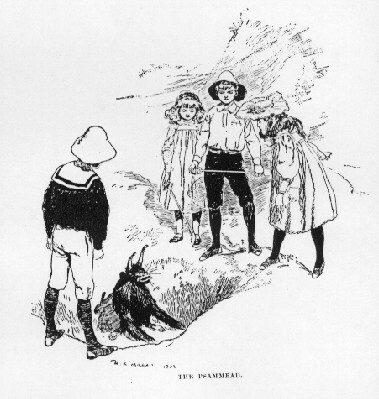 This is something rarely seen in works of Victorian and Edwardian children’s fantasy. There’s also the Psammead himself to consider. The traditional Victorian fairy was often seen as wispy, delicate and beautiful. The Psammead, in contrast is bizarre-looking. He is described as having a round body like a spider, the hands and feet of a monkey, a rat-like face, a bat’s ears and most notable of all, it had eyes on stalks like a snail. If the traditional Victorian “flower fairy” was meant to represent the beauty of nature then the Psammead might be meant to reflect the more bizarre side of nature. Personality-wise, the Psammead is grouchy and difficult to get along with too, always concerned with one whisker that once got wet and hasn’t been the same since. The Psammead himself is ancient but the stories he tells of the distant past are less grounded in fairy tales and myths and more in paleontology. He tells of days when the gravel pit was still near the seashore and when human beings would catch psammeads to wish for megatherium (prehistoric ground sloth) and pterodactyl (prehistoric winged reptile) steaks to eat. Nesbit grounds the premise of the story in the familiar tale of “The Three Wishes” but grounds the rest in a modern world that knows about prehistoric man and giant ground sloths. At the time it was published, this probably gave young readers a greater sense of the magic happening in the “here and now” (which is now the “there and then”) much like modern urban fantasy like the Harry Potter books do today. There’s also just something about how Nesbit writes children and particularly siblings that rings true. There’s a certain vitality to the way she wrote them. They argue and make jokes and get on each others’ nerves and use slang and do plenty of other things that more “proper” children in other books wouldn’t do and yet they’re still good kids. With the exception of maybe Jane who gets a bit lost in the shuffle, you feel that you know these kids and their personalities by the end of the book. Heck, it’s one of the first classic children’s books I’ve read that shows how annoying it can be to have a baby brother, seeing as the Lamb can be a bit of a handful. We even get a rather active little heroine in Anthea , who takes charge when one particular wish goes off the rails. Not all of it is great. There are some rather dated elements considering how the book is 115 years old. There’s one chapter in which Cyril accidentally wishes to fight some “Red Indians” because he’s been reading The Last of the Mohicans. There are some stereotypes thrown around in that chapter that are clearly taken from the adventure fiction of the time period. The book also nearly stereotypes a group of Gypsies in one chapter but ends up stopping just short of doing it. Also, the things that I find interesting about this book might be found boring by others. For example, I find I tend to be kind of fascinated by fantasy stories that have enough conflict without having a primary antagonist. It seems like it would be a trickier thing to do rather than just having a villain to pin everything on. But I can see how some might find a book entirely built around wishes gone awry as a little dull. But I still think this book is rather good. So, why isn’t it more well-known? Well, it never got particularly popular on the American side of the Atlantic Ocean, which can impact media proliferation. Now, I’m not going to say media adaptations are necessary for a book to become well-known, but it certainly helps a lot. Alice’s Adventures in Wonderland and The Wonderful Wizard of Oz might not be quite as well known if they didn’t have movie tie-ins going back to the age of the silent movie. There have been some adaptations, but they’ve been largely localized to the UK. There was a BBC miniseries, for one. There was also a movie which seemed to chuck the existing story and turn the whole thing into a silly comedy. I can’t say that they look too appealing to me. Partially because they both chickened out on making the Psammead look truly bizarre. Both adaptations gave him regular eyes and then turned the eye-stalks into antennae. 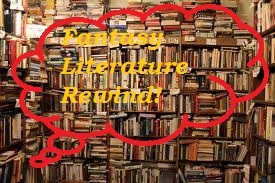 But hey, that’s part of what “Fantasy Literature Rewind” is for, shining a light on fantastical literature of the past beyond the Carrolls, Collodis, Baums and Barries (though, I love all of them too). So, if you like children’s fantasy literature and you’ve never tried it, give Five Children and It a chance. You may end up wishing for more. I read this book years ago and loved it! I only knew about Nesbit because my mom recommended it to me, as she had read this in her childhood, as well as "The Enchanted Castle". Definitely hidden gems! Folk Tale Secret Stash: Issun Boshi.